From atop a steep slope above Myers Way in West Seattle, Cass Turnbull peers over a tangle of blackberry bushes. Her perch affords her an exceptional view of the distant Cascades. But her gaze fixes instead on the island of undeveloped acreage more than 100 feet below the blackberries. 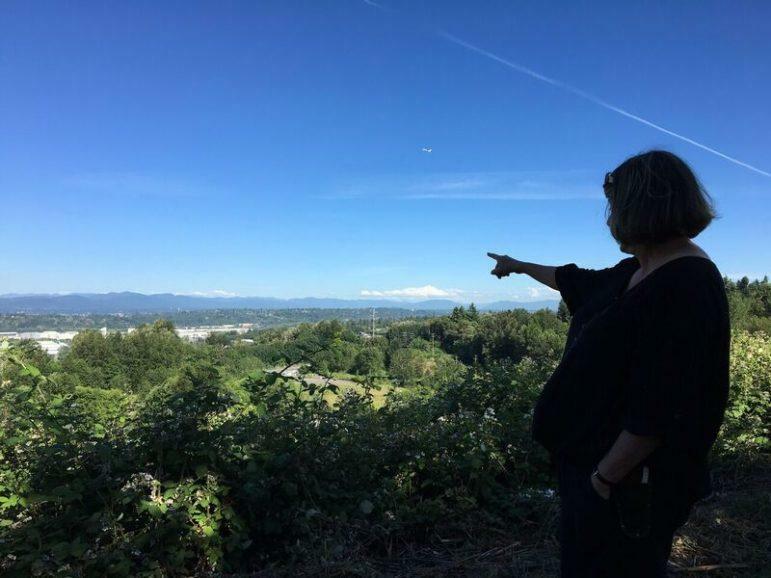 Instead, this green island — the largest piece of undeveloped ground owned by Seattle taxpayers with the potential to be turned into a decent-sized city park — is up for sale. The city tried this once before, in 2007, but the Great Recession scotched the deal. Drivers heading toward downtown from White Center along Myers Way would have a hard time knowing the peril of the leafy lands they pass. But Turnbull and a handful of other green space activists from across Seattle have been battling the city for almost a year to keep this particular green canopy from being transformed into acres of asphalt and concrete. City officials say they need the cash to alleviate the homelessness crisis, a position that infuriates parks activists such as Turnbull, who say the issues are unrelated. Cass Turnbull has been battling the city for almost a year to keep this green canopy from being transformed into acres of asphalt and concrete. The issue comes to a head later this year when the City Council makes a final decision about the potential sale. But make no mistake—the debate around the so-called Myers Parcels is just one piece of a much larger issue facing the city. Put simply: We are running out of open space. “The mayor continues to focus on affordability as a key challenge,” said Murray spokesman Jason Kelly. Seattle has long touted itself as one of the greenest cities in America, and in fact was named the nation’s most sustainable city. It boasts of numerous parks, green building standards, energy efficiency programs, and a commitment to carbon neutrality, among other attributes. Yet, to Turnbull’s TreePAC activist group, the Seattle Green Spaces Coalition, and the Veteran Conservation Corps, among others, the city doesn’t value parks and green spaces as much as it should. The groups, which have united to push for protection and development of these aspects of the urban environment, cite benefits to tourism, public health, water and air quality, and the flood risk reduction that parks provide. “There simply isn’t that much land available in the city,” says Tom Hauger of the city’s Office of Planning and Community Development. The new draft of the Comprehensive Plan, released last month and currently being reviewed by the city council with a vote expected sometime this fall, doesn’t include any prescribed measurements. It defers the particulars to next year’s update of the Parks Development Plan. In place of those metrics are broad statements about “realistic” and “attainable” goals and vague plans to look for “new strategies that take advantage of limited opportunities” — opportunities that are, yes, decidedly constrained by the city’s current parks-acquisition budget. The city Budget Office and Parks and Recreation department crunched the numbers last summer and concluded in a memorandum to the City Council that Seattle is growing far too fast to do what was envisioned a decade ago. They reckoned that would require buying 1,400 acres — nearly 20 times the size of Seattle Center and representing a 20 percent increase in the city’s total parkland — over the next two decades. The $20 billion to $30 billion it would take to make that purchase is out of reach, they say, for a city with a general fund that runs just a tad above $1 billion a year. Not only is the city reluctant to purchase that amount of new land; it is now selling off the Myers Parcels, one of the most valuable pieces of undeveloped ground in its inventory. 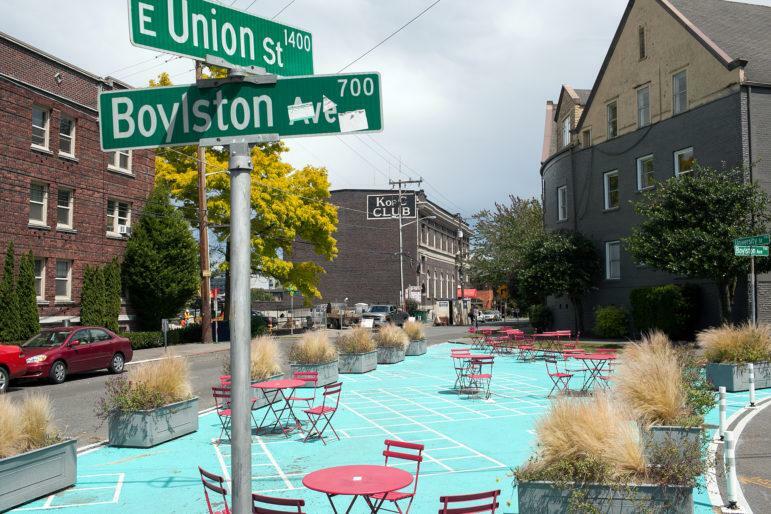 Walking through the north end of First Hill, it’s hard to miss the bright blue swath of pavement at the junction of University and Union streets and Boylston Avenue. 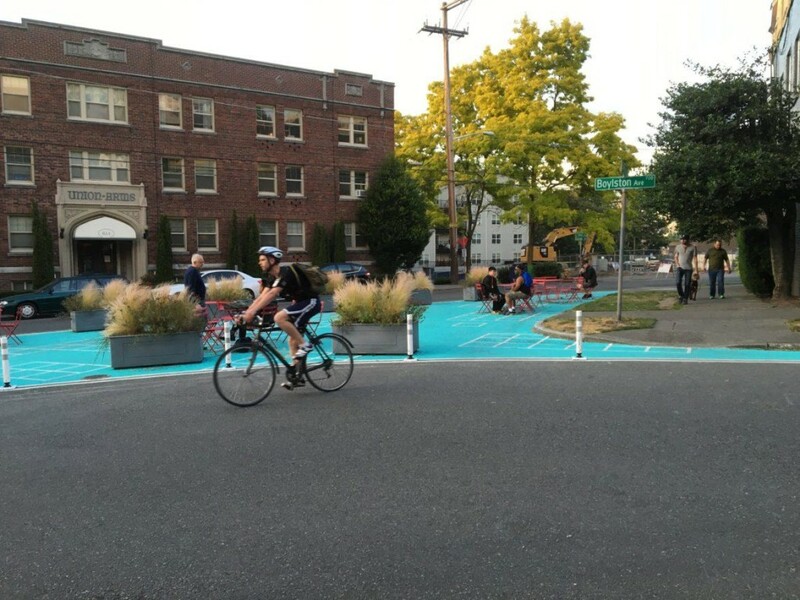 Until last year, this part of the city was just another underutilized intersection, but since then it has been transformed into what the city calls a “pavement park.” Yep. Nearly devoid of green. And hemmed in on either side by traffic. On the blue-painted asphalt sits a group of bright pink metal chairs and tables, separated from passing cars by large cement planters. The incongruous setup, with its cheerful color scheme, is the latest in what the city calls “creative” solutions. And it’s one of the first of such parks that may soon dot the cityscape. Pavement parks are a growing trend in major American cities and they’re one of the new ways Seattle is looking to increase open space without spending billions. The city is turning public rights of way and lightly trafficked intersections into outdoor public spaces. On a sunny day at the pavement park on First Hill you might see a couple of people eating lunch or checking their phones. It’s definitely a cute improvement on the largely unused intersection that came before. But the bright blue pavement doesn’t look anything like, say, Discovery Park. You know. A real park. That’s precisely the issue that city residents like Tim Motzer take with it. Motzer, a former parks department employee and current City Neighborhood Council representative, analyzed the new draft Comprehensive Plan and found that the city was “basically looking at using streets as a substitute for actual parks.” He acknowledges that buying new parkland is expensive and argues that creative solutions to finding more open space are important—but painting the pavement doesn’t cut it. In contrast, City Council Member Rob Johnson is excited about the idea of expanding the definition of open space to include these public rights of way. “We have in this city about 30 percent of our total city land as roads and streets. And that is a huge opportunity for us to consider creating a lot more open space in the city,” he says. He speaks fondly of plans to create more parks in intersections, semi-permanent parking space “parklets,” and neighborhood “play streets” at certain times of day. Consider that about the same time the Comprehensive Plan went into effect two decades ago, Seattleites had the opportunity to create a huge patch of green space — but blew it, parks advocates say. Voters said no. Instead it stayed underutilized industrial land for another decade-plus until the current Amazon-anchored building boom there ensued. Today a city-produced map showing gaps in open space reveals big swaths of South Lake Union underserved by parks. The same goes for many other neighborhoods, including Sodo, downtown, Fremont, Bitter Lake, Northgate, the U District, Ballard, First Hill and Capitol Hill, all areas that make the neighborhood around the Myers Parcels seem relatively well-served. Voters did show up for parks in 2014, when they approved the establishment of a Seattle Parks District, run by the city council, and an accompanying levy that supports a $48 million annual budget. But only $2 million per year of that money has been budgeted for acquisitions in the face of the minimum $2 billion a year the city would need to spend to keep up with the current goal. That money isn’t even targeted for buying big parks like the Myers Parcels; rather, it is supposed to go toward improving walkability to parks in the city’s densely populated urban villages, such as Ballard and First Hill. Even that seems like a too-tall order. At the price of property in Seattle today, $2 million would buy about 5,000 square feet in First Hill, according to Parks and Recreation Acquisition Planner Chip Nevins. That’s roughly the size of two large houses. Then there is the fact that the city currently faces a $267 million parks maintenance backlog. Mayor Ed Murray campaigned on a promise of closing that gap, boosting maintenance and development of existing city parks. This emphasis on existing parks first has environmentalists worried. They fear that if the city doesn’t acquire new green spaces now, there won’t be any new green space within the city to acquire in the future, or what will still exist will be prohibitively expensive. Seattle has added nearly 90,000 people over the last ten years, and an additional 120,000 are expected to move to the city over the next twenty. Amid the push for density to house those people, is the city properly valuing its parks and open space? Perhaps not, judging from a 2011 study on the economic value of Seattle’s parks by the Trust for Public Land. The report points out that the parks system provides direct monetary benefit to the city and the private sector. Toting up the value of parks to tourism, public health, water and air quality, and flood risk reduction, among other areas, the report estimated savings to the city government at nearly $32 million a year. One-tenth of that is savings in controlling water and air pollution — value that cannot be acquired through pavement parks. City residents reap most of the parks’ value: $511 million a year in exercise, health and similar benefits, and $110 million in higher property values and tourism-related earnings. More than five years after release of that study, Seattle still is figuring out how to translate those numbers into city policy. Last November the City Council directed city departments to start incorporating the value of green infrastructure into the city’s asset portfolio. It’s a slow process, though, and won’t be far enough along to have any sway over the policies of the Comprehensive Plan before it’s passed by City Council this fall. Council Member Johnson, who is chair of the committee in charge of the Comprehensive Plan, which has scheduled its first public hearing on Monday, June 27, at 6 p.m., noted that this update to the plan is not as strong on environmental goals as previous versions. Despite those sentiments, back at the Myers Parcels, the city has found financial temptation to be too strong. The growth explosion of the last decade that drove real estate prices skyward had the same effect there, boosting its 2003 value of $2.5 million to $14 million today. Ruben Deleon grew up in a house that bordered the Myers Parcels. He recalls many afternoons spent exploring the undeveloped lot with other neighborhood kids. “It was really my first exposure to being outdoors,” he says, listing different animals he saw there — hawks, moles, goats, even coyotes. Now 23 and a University of Washington student, Deleon no longer plays in the Myers Parcels. But he, like Cass Turnbull, would like to see his old stomping ground become a public space for future generations rather than asphalt and concrete. The parcels aren’t just a nice patch of green; they’re also a natural buffer for the neighborhood against nearby industry. To the east, the industrial parts of West Seattle and the Duwamish River Valley sprawl out. On the northern edge lies the city’s Joint Training Facility for city firefighters and utilities inspectors. And to the west, King County intends to build affordable housing. Despite all the nearby industry and the busy traffic of Myers Way, just a hundred feet inside the property, the sound of cars fades away, replaced by the calls of birds and the rustle of animals in the undergrowth. Walking around, you can almost forget you’re in the city as the trees close you off from all but a view of the top of the training facility next door. The city acquired the property from Nintendo in 2003, looking to build the Joint Training Facility. Nintendo refused to sell just a portion of the property, so the city took a loan to pay for all of it, ending up with more than 30 acres of additional land. The city’s Facilities and Administrative Services department took control of the excess property and asked if other city departments were interested in the land. None were. So it went up for sale. The city then entered into a contract to sell the land to Lowe’s, but Lowe’s backed out and the recession hit and the sale was put on the back burner. Fast forward to 2016 and the city has started the same process again. Despite local residents’ push for a park or affordable housing, neither the city housing office nor the parks department wants the land. The housing office says since the site was once a gravel mine, about a century ago, it’s not a good site to build, especially with the added cost of extending sewers and electric lines to the property. The parks department objected as well, preferring to use its budget for that part of town to maintain and improve Westcrest Park, less than a quarter-mile away. It’s not a city priority to keep it because by the city’s density-based standards there is already enough green space in that area. And even if another city department wanted to take over the land, it would have to pay off the remainder of the loans. Murray isn’t having any of that. “The mayor continues to focus on affordability as a key challenge,” said Murray spokesman Jason Kelly. The current plan would reserve five acres to expand the Joint Training Facility; sell off the largest part of flat land, about 13 acres, for commercial development; and keep the remaining southern and eastern sections of the parcels as open space for now. Those two sections totaling 22 to 24 acres have the most tree coverage but are divided by busy Myers Way, and contain steep slopes and wetlands, limiting accessibility to pedestrians and making them unlikely candidates for parks. The city is also looking for a buyer for those last 22 to 24 acres, with the stipulation that the buyer would have to preserve the natural environment of the property. If no buyer is found in the next two years, the land would be folded into the parks department holdings. The plan to sell the developable 13 acres still has to be approved by the council this fall. The parts slated for development include federally protected wetlands that would have to be built around, a task the city failed at when constructing the Joint Training Facility from 2004 to 2007 (only to be caught by environmentalist John Beale. The city paid $4 million required by federal authorities for environmental enhancements in the area to make up for the damage. Later the city agreed with environmentalists to pay for an additional $400,000 worth of work, but that has yet to happen). The 13 acres for commercial development are expected to sell for $10 million to 12 million, $5 million of which is to be used to help the homeless, keeping with a plan that Murray announced in November and for which the council soon after earmarked funds. Another $1.3 million would finish paying off the original loan, and $500,000 goes for city contractors and expenses. It is unclear where the remaining $4 million to $6 million would be spent. Parks advocates say if the city goes through with the deal, it will be sorry. Yes, homelessness needs attention, they say, but Murray is creating a false choice between helping the homeless and green space. “We can have both,” Turnbull argues. A public hearing on the Comprehensive Plan is scheduled at 6 p.m. Monday, June 27, at City Hall. A public meeting on the fate of Myers Parcels is scheduled June 30 at 6:30 p.m. at the Joint Training Facility. This entry was posted in Parks, tree planting, TreePAC, urban trees and tagged TreePAC. Bookmark the permalink.